The gallery in Roppongi, however, will remain open as per its normal schedule. Thank you for understanding, and we hope to see you again soon. We hope this finds you all well as the leaves begin to change and autumn begins to shift into winter, with the evenings growing ever more chilly as October reaches its end. To warm your spirits, I would like to introduce a work on display in Shirokane now - a gilt bronze Jūichimen Kannon from the Heian period. Although only a bust remains now, it measures nearly 30cm in height and would have been a considerably large kakebotoke (lit. "hanging buddha") in its original form. 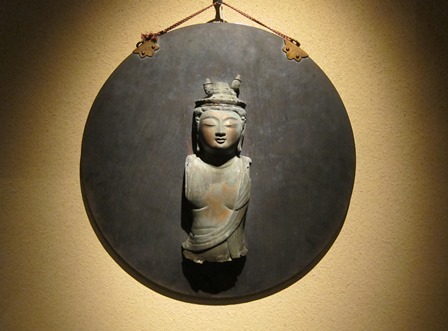 Kakebotoke are Buddhist deities that were carved or cast in relief, adorned with a variety of decorative elements, mounted on bronze or wooden discs and then hung within temples. 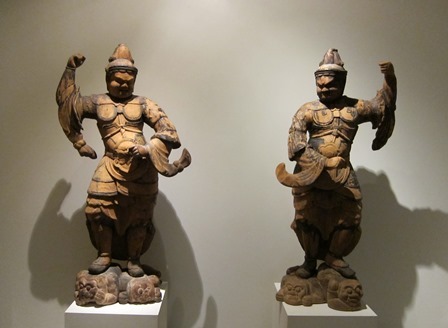 Before the Meiji period, they were also called mishōtai, or the "true form" of the deities they represented. 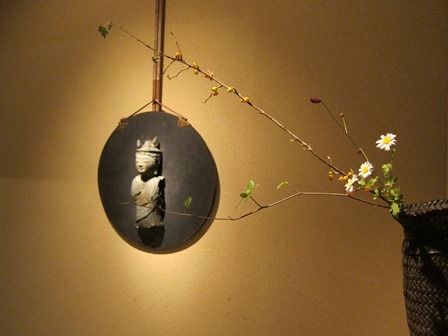 According to the honji-suijaku theory developed in the late Heian period, Shinto deities were local Japanese manifestations of Buddhist deities, and their forms were etched into mirrors and copper alloy discs, and dedicated to shrines. Calm, gentle expressions such as this are typical of Heian Buddhist sculpture, but the soft, graceful eyes of this piece particularly seem to completely envelop those of us looking at it. 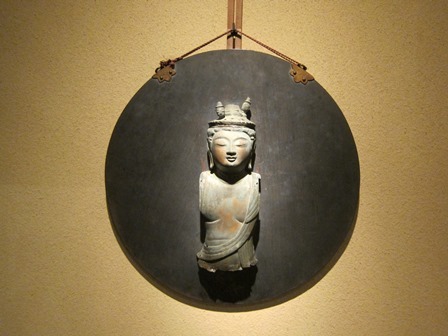 One visitor said on their way out, "The sculpture quietly hiding in the back tokonoma has left me feeling so at ease!" which was wonderful to hear. We hope that you too will take advantage the opportunity to come see it before the end of our current exhibition on Saturday November 2. We are pleased to announce the opening of the next exhibition in Shirokane. Welcoming you at the door is a pair of Deva Kings, whose forms are beautifully carved. Also on display are the screens "Flowers and Birds of the Four Seasons" by Hasegawa Tōkaku, which were displayed last summer and liked by all. Please do not miss the opportunity to see these rare pieces on display here yet again. ※Please note that certain objects on display will be rotated throughout the show.